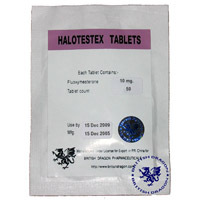 Halotestin (fluoxymesterone substance) is precursor of methyltestosterone, which is more androgenic by nature than plain testosterone. Anabolic properties of halotestin are not very strong thus it’s mostly used for increasing strength rather than muscle gains. This is especially interesting for powerlifters, who need to increase strength without increasing own mass and moving to higher weight class. In bodybuilding, Halotestin is mostly used in pre-competition stacks thanks to it’s strong androgenic effect, low aromatization and maintaining low estrogen levels. This leads to decent improvement in muscle hardness and shape, especially if athlete has low body fat. Dosages like 20 mg/ED does not cause water retention. Halotestin increases recovery, allowing more intense training. In addition, users report increased aggressiveness, which makes it useful not only to bodybuilders or weight lifters but especially to football and hockey players and fighters of all kinds. Dosage for bodybuilders normally range between 20 and 30 mg/ED. Powerlifters should go with 40 mg/ED, sometimes more. Split daily dosage on two equal parts and take mornings and evenings with substantial amount of water. Could be taken along with meal. Since this is mostly androgenic steroid it requires anabolic component to increase cycle effectiveness. For pre-competition cycle it best stacks with primobolan in order to avoid water retention and “puffy” muscles. For more gaining Tables of Cycles and even contest preparations it could be well stacked with Nandrolone Decanoate, (deca), oxymetholone (Anadrol/Anapolon (Oxymetholone)) or Boldabol (Equipoise). Improved strength induced by Halotestin could be turned into solid, quality muscle gains by taking the above mentioned gear. This is extremely beneficial to the athletes who are prone to estrogen-related sides such as water retention and swollen breast glands. Maybe only Anadrol (Anadrol 50 / Anapolon 50) (oxymetholone) produces more side effects than Halotestin (fluoxymesterone). Usage of this product within the cycle should not exceed 4-6 weeks with 20-30 mg/ED in most cases. Halotestin is highly liver-toxic and thus using of liver protectors such as Liv-52 or Essentiale Forte is highly desirable. Also it may cause gastrointestinal pain. And, of course, it suppresses endogenous hormonal production, so proper PCT is required. Athlete should at least use clomiphene to restore afterwards. Also increased aggressiveness in males reported. Gynecomastia and high blood pressure are not the case with it.